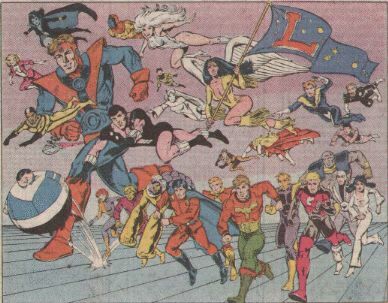 Characteristics: The Legion in their classic costumes, as they appeared in ADVENTURE and ACTION COMICS. 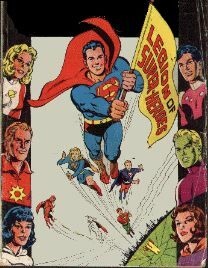 Superboy was a full-time member, and was involved in most stories. 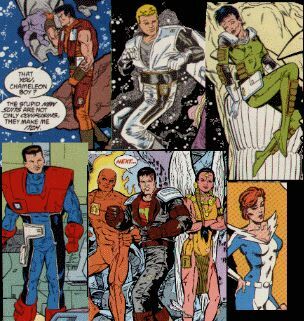 This picture was too good to pass up, but Cosmic Boy should really be showing lots of chest in his abbreviated black "painted-on" costume (the one that was held up magnetically). The Modern Legion operated out of a complex of buildings on Weisinger Plaza in Metropolis. 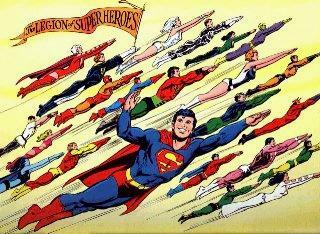 Superboy was an on-again, off-again member, moving between active and reserve status. His participation in missions declined as this era progressed. The Postmodern Legion operated mainly from a floating Headquarters designed by Brainiac 5 as a replacement for the buildings wrecked by Omega. Superboy was a reserve member during the first part of this period; in the wake of the Crisis on Infinite Earths, he was slain by the Time Trapper. The Pre-Zero Legion operated out of the same floating Headquarters as the Postmodern Legion. Superboy's statue appeared in the Hall of Dead Heroes.